In this Feb. 21, 2018, file photo, then-White House Communications Director Hope Hicks attends a listening session hosted by President Donald Trump with student survivors of school shootings, their parents and teachers in the State Dining Room at the White House. The company, which will be spun off after Disney completes its takeover of 21st Century Fox, will be home to Fox News, the conservative-leaning news and commentary network. Trump is an outspoken fan of Fox News, often promoting their programming on his Twitter feed. White House communications director Hope Hicks said she will resign from her position in the coming weeks. The announcement came a day after Hicks spoke before the House Intelligence Committee on Russian interference in the 2016 election. 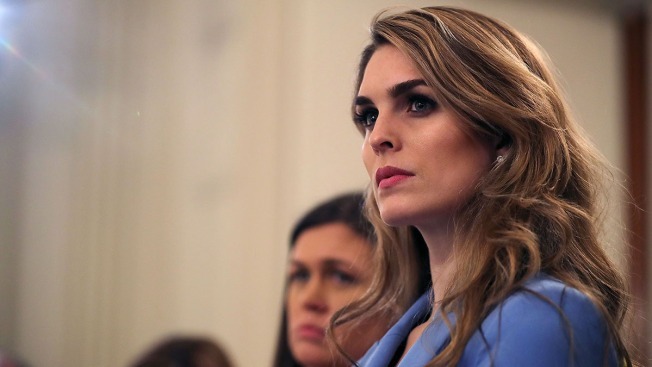 Hicks admitted to the committee that she would occasionally tell “white lies” for the president.